Historical romance . . . with a twist. The eagerly awaited next installment of the Twist Series that began with 2015 RITA® Award Finalist My Lady, My Lord. The Goddess of love is trapped in a statue in Regency England, and one altar shy family is about to discover just how dedicated Aphrodite is to her work. Now, trapped by disaster in a country inn, Calista has one day to convince the marquess she’s worth a second chance, and Dare has one goal, to steer clear of déjà vu. But when the day takes an unimaginable twist, what will it take to end up in each other’s arms? 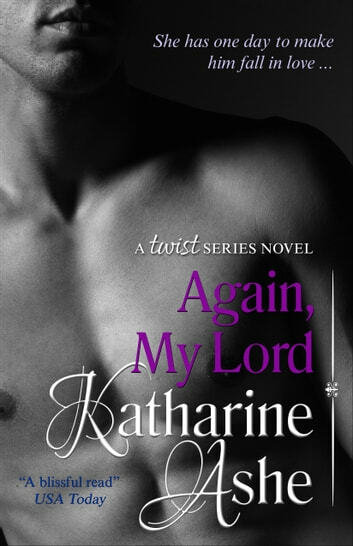 AGAIN, MY LORD is the second book in Katharine Ashe’s brilliant and innovative A Twist series, and as the first instalment, it is a total delight! Calista Holland is bringing back the statue of Aphrodite her mother loves so much, and at the same time she will pick up her beloved son; her mother and sister are taking good care of him while she’s away, and it’s all that counts. However, on her way to her back, she stops at an inn because the rain that had been falling is threatening to flood everything. And whom should she see but the man who refused to help her 6 years before: Tacitus Everhard, Marquess of Dare. Tacitus has forever been in love with Calista, who left him high and dry to marry someone else. But there are so many things that both ignore about that fateful day. And even though they will be stuck for one very, very, very long day, Dare will remain somewhat confused, but Calista has a lot of time to think about what went wrong. I refuse to give out any spoilers, but AGAIN, MY LORD is brilliant! The Great Katharine spins an exceptional historical romance yarn, based on a popular movie, and again as was the case with My Lady, My Lord, there is magic involved. AGAIN, MY LORD is in turns extremely amusing, very romantic, and tugs at your heartstrings. Calista has had a very rough married life, while “I am Dare” has more or less coasted along. Tacitus is in fact quite taciturn, which I thought was a very clever name for him; he is a Peer through and through, because it’s what he does, especially since Calista left. But to his dismay, Calista has lost her sparkle and it pains him. But because of some very peculiar goings-on, they have no choice but try to be civil to each other and… I will say no more on the story, except that it is riveting and captivating to the very end! There are plot twists I never expected, character development is absolutely stellar, and what to say – again – about Katharine Ashe’s dazzling writing! The prose is luminous, elegant, her attention to proper vocabulary is legendary; the dialogues are delightful and natural, and the banter between Tacitus and Calista is unparalleled, because it goes through the whole range of emotions as the book progresses. I had loved the first book, and AGAIN, MY LORD is just as good! What a great series! I received a complimentary copy of this book in exchange for an honest review.